Overview: Camelback Walk is a nice, easy urban hike. 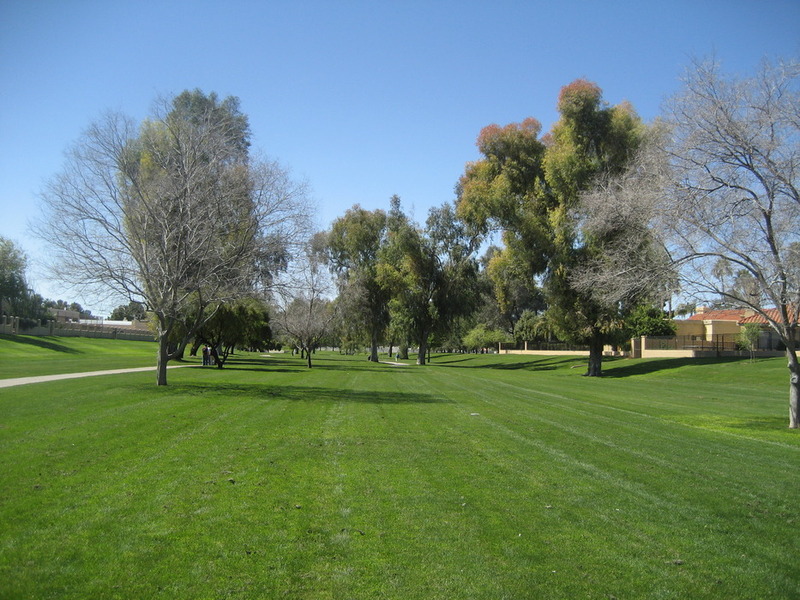 This paved and landscaped trail is on the northeastern-most part of McCormick Ranch and is maintained by the McCormick Ranch POA. 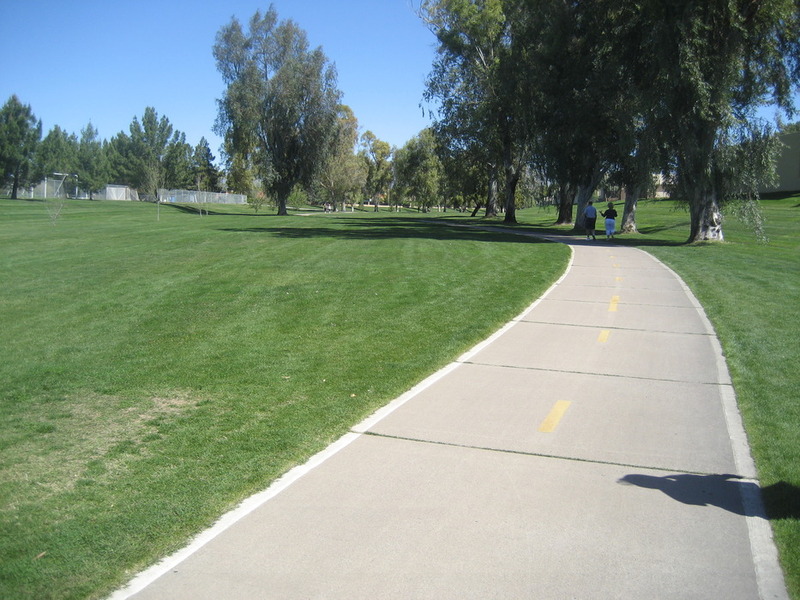 A City of Scottsdale representative has described Camelback Walk as one segment of a trail that extends from WestWorld to Tempe Town Lake. Located just a few blocks east of AZ101 on Shea Boulevard, this trail is easy to get to and offers a number of nearby pre- and post-hike refreshment options (92nd Street Grill and Jade Palace right at the trailhead and more than a dozen other restaurants within five minutes). 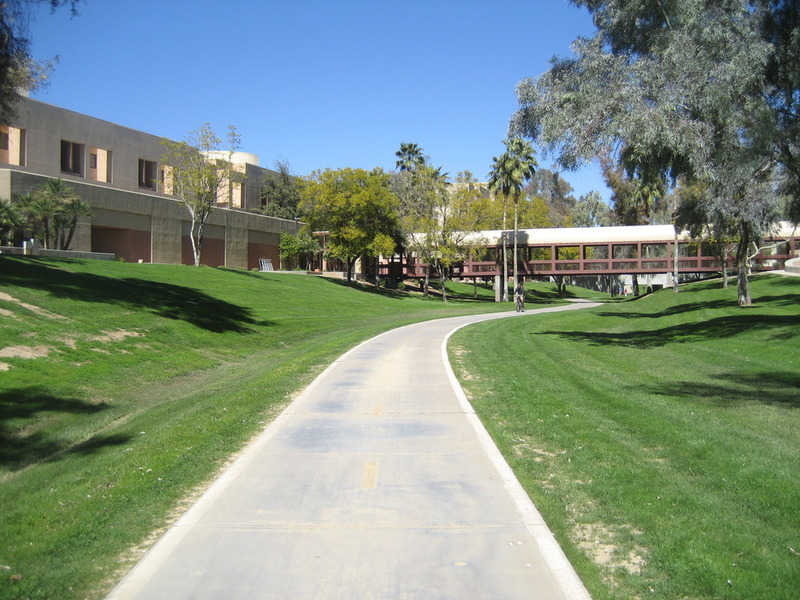 Camelback Walk does not, itself, have restrooms or drinking fountains, but these facilities are available at the public library, playground, and (in dire circumstances) hospital along the way. 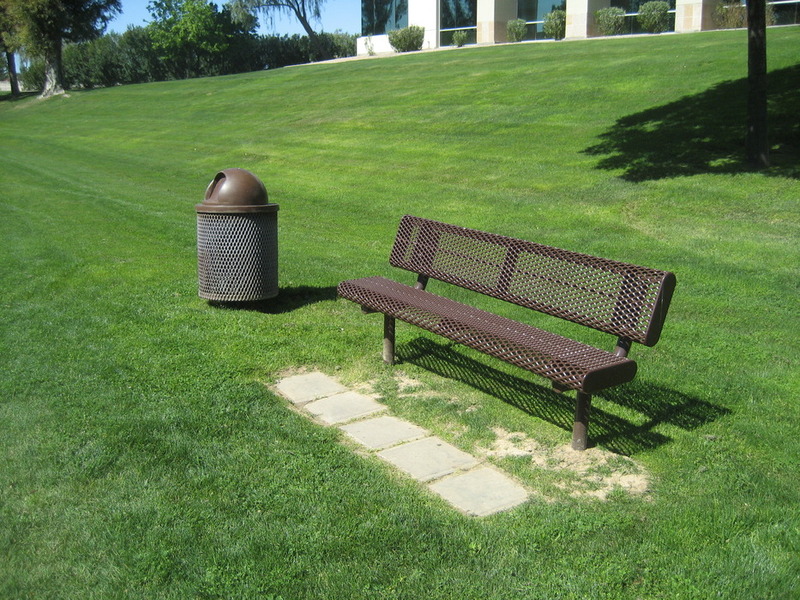 There are benches and trash receptacles on the route. This trail is also popular for mountain biking and jogging. Hike: Although the actual "trailhead" is across 92nd Street at the northwestern entrance to Paradise Memorial Gardens, many people use the insertion point proximate to the parking lot of the 92nd Street Grill as the starting point (roughly 33.58426, -111.882859). After parking next to the 92nd Street Grill, make your way to the starting point and walk down onto the trail. The initial segment is xeriscaped and winds behind the strip mall and through a tunnel underneath Shea Boulevard. Emerging south of Shea Boulevard, suddenly there is grass and trees. The paved path cuts through a lush, but constructed, meadow from this point all the way to the end. On your right (to the west) now is Scottsdale Healthcare Shea. 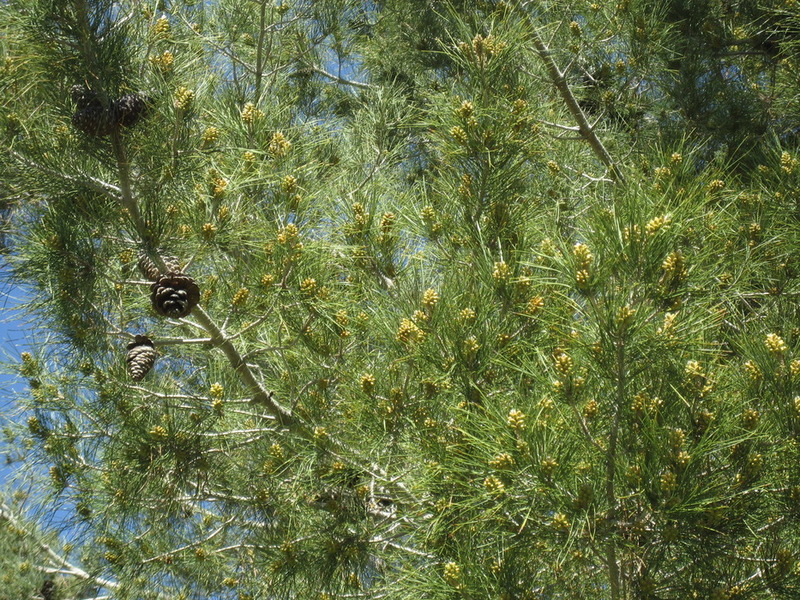 As you progress south, you will see many varieties of trees on this trail, including eucalyptus and pine trees. 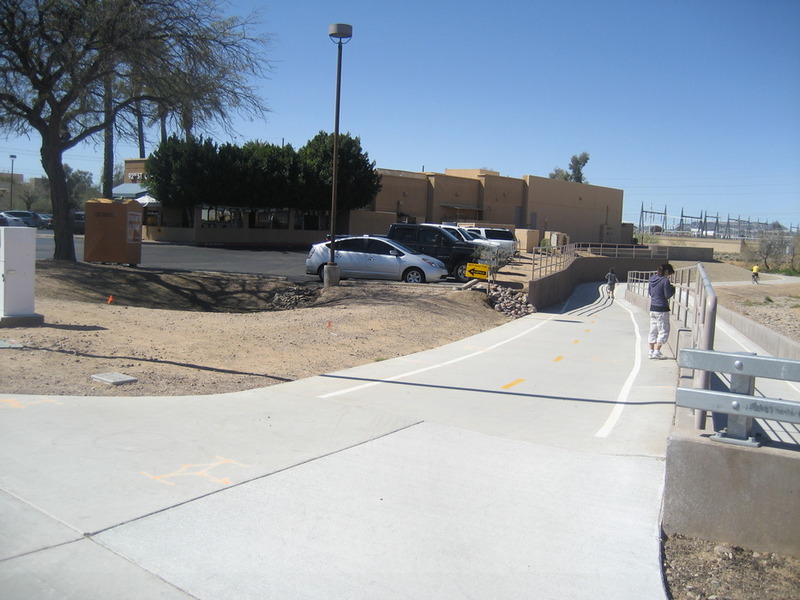 As you make your way to the endpoint of this segment, you will cross underneath Mountainview Road, 90th Street, AZ101, Via Linda, and finally Hayden Road. When you emerge from the final tunnel, you will see Lake Angel and its water fountain. 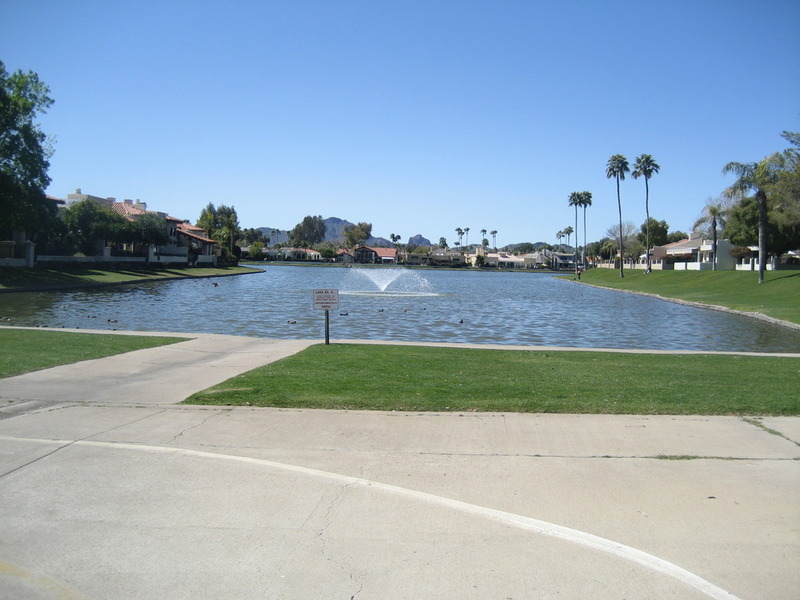 Although Lake Angel is the endpoint of Camelback Walk, the trail heads off to the left (southeast) and continues parallel to Hayden Road. Take AZ101 (Pima Freeway, East Loop) to the Shea Boulevard exit. Drive east on Shea one-half mile to 92nd Street. Turn left (heading north) and a short 500 ft later, turn left into the parking lot for the 92nd Street Grill.